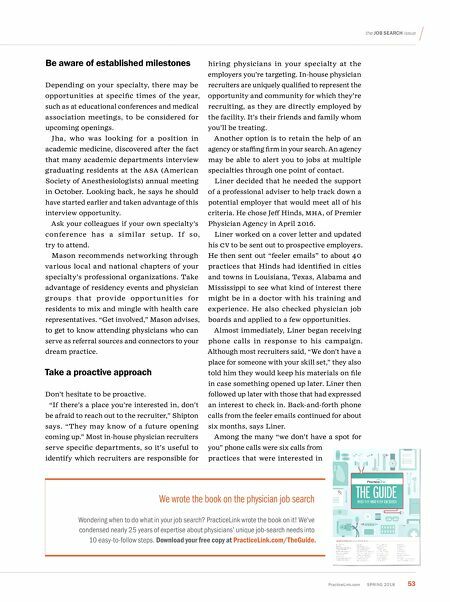 52 S PRIN g 2018 PracticeLink.com Explore how you can join a team of faculty and physicians who believe diversity and inclusion are powerful, uniting forces. Please visit joinrush.org or e-mail faculty_recruitment@rush.edu for more information. Building a strong provider team RUSH IS AN ACADEMIC HEALTH SYSTEM whose mission is to improve the health of the patients and the diverse communities it serves with nationally recognized health care, education and research, as well as a commitment to community partnerships. As both a leading healthcare provider and major employer, Rush is committed to creating equal opportunity for all, and recruiting a staff that reflects the communities we serve. More than 49 percent of Rush employees are members of minority ethnic groups, and 72 percent of employees are women. For nine consecutive years, Rush has been named a leader in LGBT health care equality in the Healthcare Equality Index (HEI) report. Our goal is to increase representation of all groups from throughout Chicago's different communities so that we can benefit from their unique perspectives and abilities, and provide the best patient care. 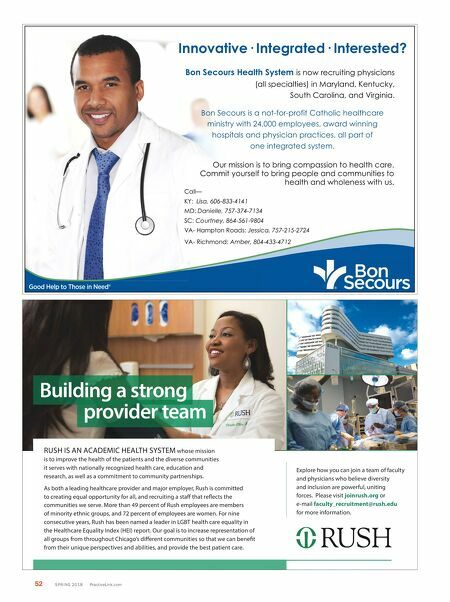 Bon Secours Health System is now recruiting physicians (all specialties) in Maryland, Kentucky, South Carolina, and Virginia. Our mission is to bring compassion to health care. Commit yourself to bring people and communities to health and wholeness with us. Innovative· Integrated· Interested? Call— KY: Lisa, 606-833-4141 MD: Danielle, 757-374-7134 SC: Courtney, 864-561-9804 VA- Hampton Roads: Jessica, 757-215-2724 VA- Richmond: Amber, 804-433-4712 Bon Secours is a not-for-profit Catholic healthcare ministry with 24,000 employees, award winning hospitals and physician practices, all part of one integrated system.